Damn Rowdy in da house! First 2 months of 2019 are in, b64 are bossing around everybody. Players are literally running for their lives to fast trains as soon as we pop nearby. Even level-hoes figured out they are better off sticking to fishing/hunting by now. We are yet to lose a single posse feud. Btw forums still seem to be dead, so stick to PS4 Communities > Boulevard 64 and keep checking our Twitter @Boulevard64 for some cool content! A quick summary of state of Red Dead so far:First 2 months of 2019 are in, b64 are bossing around everybody. Players are literally running for their lives to fast trains as soon as we pop nearby. Even level-hoes figured out they are better off sticking to fishing/hunting by now. We are yet to lose a single posse feud. This was before the new update. ...before Rockstar fucked everything up. We dont need lame gifts, we don't need irrelevant freeroam modes, we don't need ripoff new weapons. All we want is for R* to do their job and start coming with the actual content. Milos was very mild in his article and should've given R* much more heat. I understand that Rockstar is living off microtransactions atm (we have been doing it too to reduce time necessary to obtain certain things) but that's not how you keep your playerbase. You need to put an actual effort like you did for GTA Online. That includes new gamemodes (not freeroam modes, showdown modes and other minor add-ons), innovation for freeroam (which is slowly dying due to becoming too dull) and an actual competitive system that allows players and teams to directly face eachother instead of doing it through lame freeroam posse feuds. What R* did was protect non-DM oriented players with their new radar system which reduced chances of fighting somebody in freeroam at all. This only made freeroam pointless for anyone other than lamers that are better off sticking to singleplayer anyway. If they don't want to encounter other players, then R* should create a private party mode option where they can invite eachother and do whatever they want isolated from everyone else. No update here at all. It's still the pointless short posse fight inside freeroam which is more like an equivalent of randomly fighting a gang on a dm SA-MP server and pretending it's a clan war. 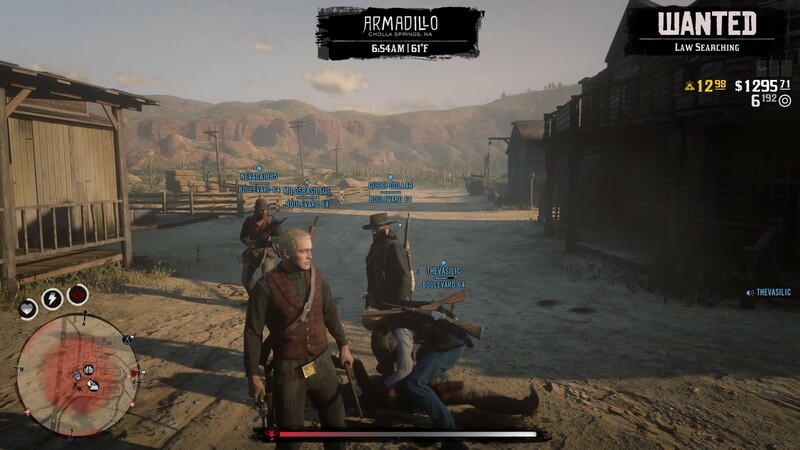 At least allow posse leaders to set up the fight type: enable/disable respawn, do more than one "round", set custom locations etc. The most useless gamemode in Red Dead Online is still not fixed. Nobody wants to play a set of different modes back-to-back. Make "Capture a territory" a separate mode and add different locations to it. Allow players to browse whether they want 2, 4, 6 or 8 teams. Allow posses to "lock" their own teams so we don't have random players join our team or in the worse case have our players shattered between different teams. I won't comment dozens of other minor useless things because they are not even worth it. Nobody cares about 2 extra weapons or some charity gifts that R* is handing out to beta players. Red Dead Online won't even make it past "beta" stage if R* continues like this. Typical Rockstar failing at creative MP ideas. Spoils of war got removed. What's up with Rowdy n 007 they were supposed to start with Red Dead?